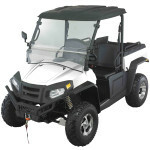 The CF500-GT 454cc UTV is mid size model that is nimble and spacious. The electronic fuel injected CF500-GT UTV has an easy access bench seat, 2 piece removable windscreen, alloy wheels and large steel tilting tray and is a practical model for many applications from farming to hunting. The ride is first class thanks to the all independent suspension with gas Nitrogen filled shock absorbers. Mindful of OH&S requirements the CF500-GT EFI UTV still has a full roll cage, safety net and safety belts ensuring protection in the cabin.